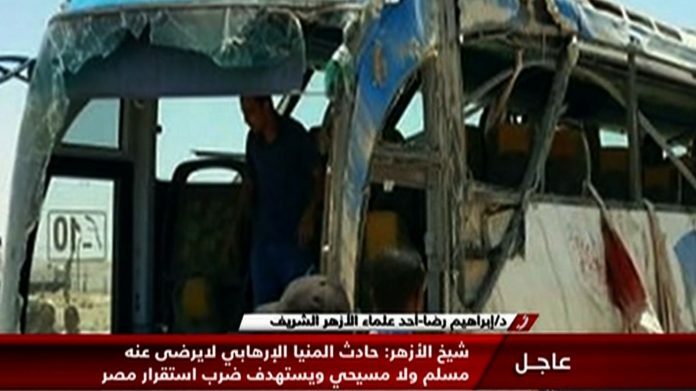 Militants opened fire on a bus carrying Coptic Christians in central Egypt on Friday. While there is no official word as to who is behind the latest attack, but historically ISIS has been responsible. The attack took place on the eve of Islam’s holy month of Ramadan, previously Islamic terrorists have conducted several mass-murders all because of a holiday. The attack against Christians brings to light yet again that Christians all over the World are under persecution. The attack took place in the Minya region about 150 miles south of Cairo. The Minya governor, Maj. Gen. Essam El-Bedewey, said at least 28 people were killed, and at least 25 were wounded when the attackers fired on the bus heading for the St. Samuel Monastery, one of several pilgrimage sites in an area that is home to a significant portion of Egypt’s Christian population. Reuters News Agency is reporting that children are also among the dead. A member of the region’s security department, Maj. Mohamed Abdel-Moneim told reporters that about ten men wearing military-style gear carried out the attack. Just last month twin bomb blasts rocked churches in the Mediterranean port of Alexandria and the northern city of Tanta, leaving 44 dead and prompting Egypt’s president, Abdel Fatah al-Sissi, to declare a state of emergency.